As noted last month, BOE dominated the production of 32” TV panels, and shifted a portion of its production away from 32” panels toward 55” with relatively little notice to customers. As it would take other panel producers a bit of time to fill the gap a shortage was created in the 32” size. The next figure shows why BOE and ChinaStar moved away from 32” panel production and why others were relatively uninterested in producing such panels. 32” panels tend to be used for entry-level sets in emerging markets, and have been declining in price for some time, particularly since 3Q 2016. Depending on the source, 32” panel prices are close to cash costs for some producers, who generally are able to bring material costs down by between 1.5% and 2% per quarter. BOE management, facing another quarter of low profitability on this panel size, shifted production to a more profitable panel size, 55”. The change came right before the beginning of the holiday build period (July through November), when TV buyers must build inventory levels to meet yearly sales goals. As BOE and ChinaStar dominated the 32” category, shifting their production created a shortage right at the time when TV panel buyers began their holiday buying. As a result of BOE’s strategy TV panel buyers bid up 32” panel prices to meet holiday season demand, as shown the next figure, causing a disproportionate jump in 32” panel prices of 11.1% M/M in July, giving BOE and ChinaStar, who dominate the 32” panel space despite the reduction, a windfall. The reaction of the brands was to grab panels before prices rose further, with the average price (including the last few months’ worth) keeping them whole. In July 32” panel prices rose by 11.1% indicating that buyers took no chances and essentially bought 32” panels at any price to fill quotas. 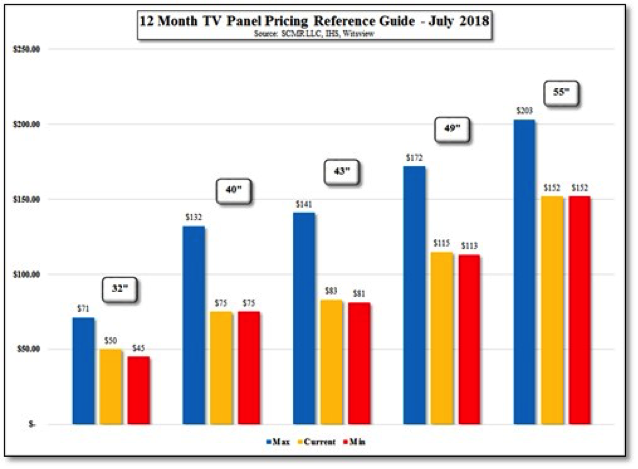 Most other TV panel prices also rose, as panel buyers fearing the same scenario developing for other panel sizes, except for 55” panels, the ones BOE had shifted production to last month. Now that supply increased in this size, buyers saw no need to chase price increases. The rise in other TV panel prices was simply ‘buyer panic’, a common malady among TV panel buyers, and while some of the increases were substantial were more defensive than practical. The July TV panel increases are noted in the next table. Panel makers did reduce utilization during May as prices were dropping and panel makers pushed out inventory at very low prices, which helped to reduce overall panel inventory, making it easier for panel producers to ask for price increases. TV brands have been less than optimistic about the holiday season this year, with little new technology to sell and the potential for trade war tariffs and potential boycotts overlaying what is already a relatively unexciting scenario. Until July, TV brands experienced declining panel prices, which still gave them reasonable profitability, but with panel prices rising, profitability comes into question. Aside from the fact that July pricing for other panel segments was benign, as shown in the next table. 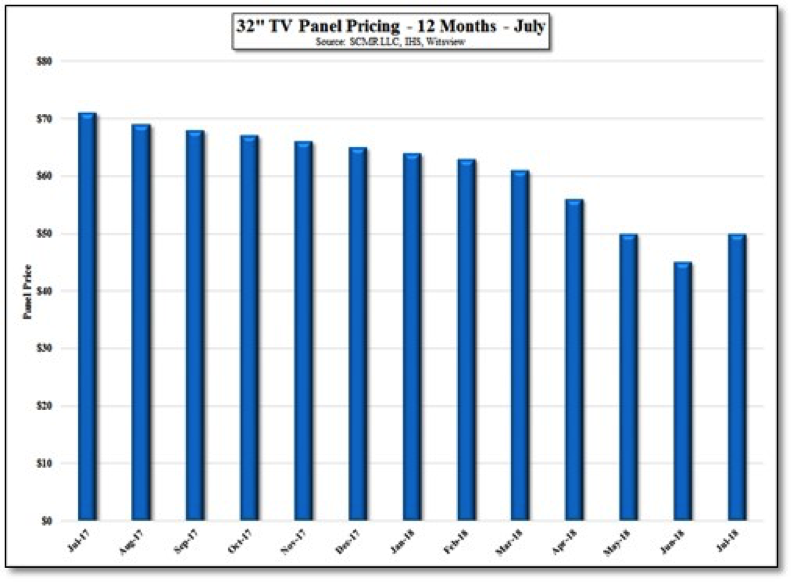 On a 12 month basis almost all TV panel sizes are still close to their 12 month lows and between 25% and 43% off their 12 month highs, so we still have a long way to go to consider this a real recovery in panel prices, but the display space is, if nothing else, a cyclical business, and cycles can be short.